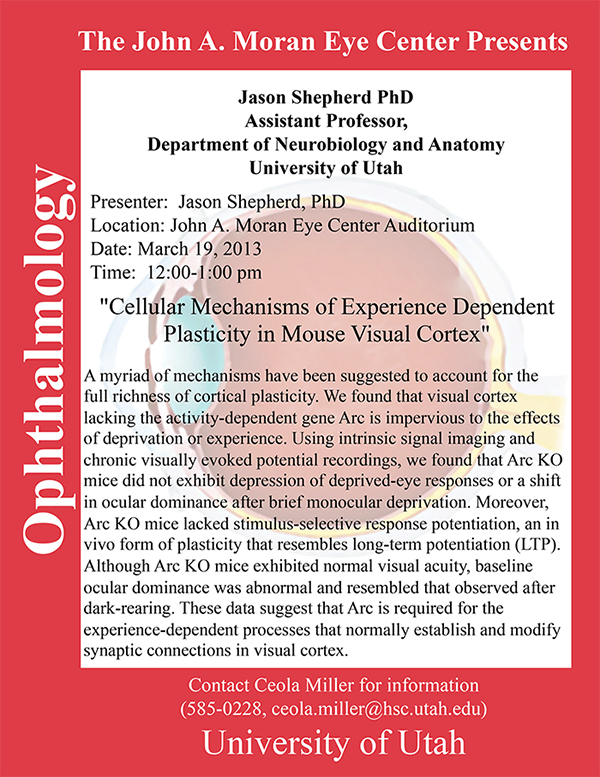 Jason Shepherd, Assistant Professor in Neurobiology and Anatomy at the University of Utah will be delivering a seminar titled “Cellular Mechanisms of Experience Dependent Plasticity in Mouse Visual Cortex” on March 19th at 12:00 in the John A. Moran Eye Center Auditorium. Abstract: A myriad of mechanisms have been suggested to account for the full richness of cortical plasticity. We found that visual cortex lacking the activity-dependent gene Arc is imprevious to the effects of deprivation or experience. Using intrinsic signal imaging and chronic visually evoked potential recordings, we found that Arc KO mice did not exhibit depression of deprived-eye responses or a shift in ocular dominance after brief monocular deprivation. Moreover, Arc KO mice lacked stimulus-selective response potentiation, as in in vivo form of plasticity that resembles long-term potentiation (LTP). Although Arc KO mice exhibited normal visual acuity, baseline ocular dominance was abnormal and resembled that observed after dark-rearing. These data suggest that Arc is required for the experience-dependent processes that normall establish and modify synaptic connections in visual cortex.